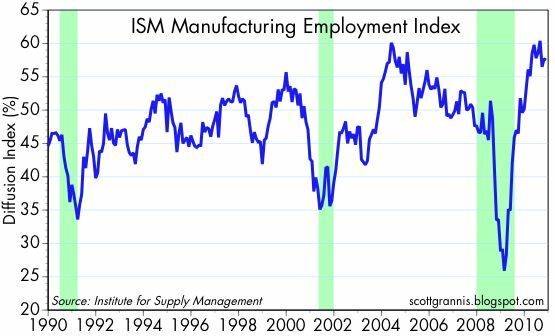 The November Purchasing Managers' Index of manufacturing came in about as expected, and continues to suggest that we will see a pickup in GDP growth in the current quarter. The current level of the index is consistent with Q4 GDP growth of 4% or so, judging from past correlations. Encouragingly, the employment index remains at relatively high levels, as does the export orders index. Meanwhile, 69.5% of those surveyed reported paying higher prices, marking the 18th month in a row that a majority has reported doing so, and further bolstering the view that deflation risk is almost nonexistent. The "forces of recovery" have been slowly building for the past 18 months, and in my opinion will not be easily derailed. Left to its own devices, the U.S. economy has a strong propensity to grow, and it has been growing despite the fierce headwinds of fiscal and monetary policy. Fiscal policy, while termed "stimulative" by politicians, has actually been restrictive, since it has borrowed massive amounts of funds from the private sector in order to feed an inefficient public sector, bolster unions, and fund a modest increase in public works. In the process, it has raised the specter of a massive future increase in tax and regulatory burdens, discouraging private sector initiative. Monetary policy has also been termed "stimulative," but so far it has only resulted in a weak dollar and fears of rising inflation, both of which dampen private sector investment by increasing uncertainty. 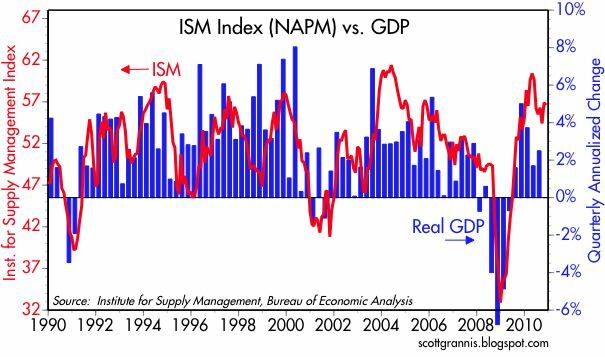 Going forward, I think there is reason to expect that fiscal and monetary policy will become less "stimulative," and thus allow the economy's natural recovery instincts to gain more traction.